Ben King. 24 April 1988 – 28 February 2016. Founder of BK’S Heroes, intending to raise awareness of Brain Cancer and Kidney Disease and funding for research into prevention and treatment of these illnesses. As a young child Ben was diagnosed with a rare condition, Tubular Interstitial Nephritis and Uveitis, which describes the fact that his own auto immune system was sent into overdrive and attacked his own organs. This malfunction of his immune system caused his kidneys to fail working at only 26% efficiency and damaging the uvea in his eyes and producing one of the few obvious signs of his illness the star shape to the lens as it was fused in his eyes. Treatment commenced at Pendlebury Children’s Hospital, Manchester where the fantastic and capable team of doctors and nursing staff although having very little historical information about this disease in so young a child embarked on an aggressive steroid treatment both orally and directly into his eyes. 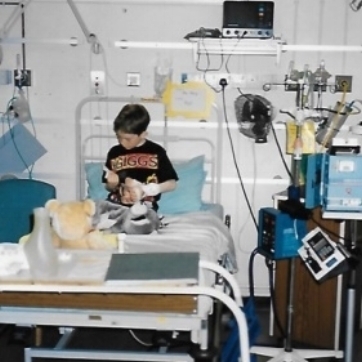 This began Ben's medical journey where even at this young age he endured lumbar punctures, bone marrow and kidney biopsies always with a smile on his face and with a happy outlook and demeanour. This treatment and close monitoring allowed recovery of Ben's kidneys to 50% function and prevented any further deterioration in his sight. A balancing regime was begun which aimed at suppressing Ben's auto immune system whilst reducing these ultimately long term damaging drugs to the minimum amount possible. Ben's underlying illness would ebb and flow which meant regular hospital visits to both Burnley and Manchester Hospitals to monitor his kidney function raising and reduce his medication when required. This treatment managed to support Ben's kidneys for many years, however the underlying overactive immune system slowly but surely continued to cause damage and Ben's kidney function began to drop away until again approaching end stage renal failure around 2005. Ben's mum and dad both began testing to find if they were suitable donors for potential kidney transplantation and were both very happy to be confirmed as suitable. Ben recovering from kidney transplant at Pendlebury. When Ben was 17 his dad was proud to be able to donate one of his kidneys to him but after initial promising success Bens new kidney began to struggle. Testing back at Pendlebury revealed ‘plumbing’ problems with the urethra having detached from his bladder but further to this a lymphocele had formed causing pressure on the kidney inhibiting its’ function. Attempts were made to drain the lymphocele by another painful procedure of inserting a needle through Ben's stomach, again endured in good spirits by Ben. This unfortunately was not successful and another operation was required to shred and drain the large lymphocele .Happily the outcome was positive with Ben's ‘new’ kidney recovering and working well. For a period of time this continued and allowed Ben to live a normal life, training and embarking on a promising career as a talented young chef and enjoying time spent with his family and friends. The underlying disease had not gone away however and in 2014 the transplanted kidney began to show signs of failure. There was a higher risk that the donated kidney would ‘Crash Land’ (suddenly fail completely) and Ben was admitted to hospital for a peritoneal dialysis line fitting, as a safety line whilst his mum, brother and friends were being screened for donor suitability. Unfortunately due to all the scarring caused earlier by the transplant and subsequent shredding of the lymphocele the procedure was unsuccessful and on top of this, when Ben came round from the anaesthetic, his vision was poor and he was experiencing severe nausea. 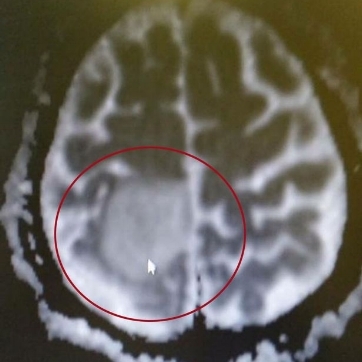 Numerous tests and scans again followed, ultimately revealing a cancerous Brain Tumour, diffuse oligodendroglyoma , a cancer present throughout the brain but with an obvious growth at the top of his head. Brain surgery was required daunting to say the least but it was successful and Ben had another scar to impress his friends with. This cancer was low grade and although needing to be monitored had the potential of remaining dormant and stable for many years. Ben however has rarely followed medical textbooks through his life and has probably caused many new chapters to be written, if not indeed a full book! 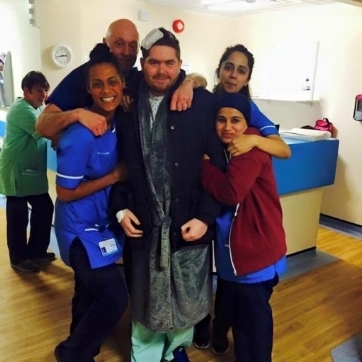 The grim reality of this cancer meant that as per medical protocol, Ben could not now have another transplant and because of his now severely reduced renal function he was unable to have Chemotherapy to help combat the cancer. Shortly after the diagnosis it was obvious that pressure in Bens head was dangerously high and although he was a coper, this caused him quite debilitating pain. The pressure had to be lowered which required, sometimes twice weekly, lumbar punctures a very painful process, to drain excess cerebral spinal fluid. It was obvious Ben couldn’t continue to have all these lumbar punctures and it was decided to fit a spinal shunt to allow the CSF (Cerebrospinal Fluid) to be drained into his body cavity. The first operation appeared to have been a success however it soon became apparent it wasn’t working properly. Partly due to reduced renal function and partly due again to the scar tissue in Bens abdomen from previous operations and the shredded lymphocele damage, the CSF was not being re absorbed. The build-up in his abdomen began forcing CSF out of the scar at his lower back. Numerous more surgeries were required to remedy this problem but during the process Ben further developed Sepsis, had seizures and was close to death. Two months in hospital were the result as the infection was treated and recovery from the numerous surgeries was allowed. Christmas 2015 was spent with mum and dad at his side, eating chicken and stuffing sandwiches. Ben triumphed again. He bounced back and although battered by the numerous surgeries continued to regain his strength and energy. 3. Can I go on rollercoasters? Ben, mum, dad,brother Dan and family had their two weeks in Florida in October 2015. It was obvious however that Ben was not at his best. On return to the Uk further tests were undertaken revealing a new tumour site which appeared to be more aggressive. This was deep in the frontal lobe of Bens brain, the area responsible for emotions control and tact!!! Another biopsy another scar and the tissue results came back as similar to the first cancer, low grade. Huge relief. This relief was to be short lived as it became apparent things were getting worse. A mega Christmas Eve and day celebration were planned and went ahead but these happy times were soon followed by a rapid deterioration in Ben's overall well-being as the tumour continued to grow. Radio therapy was planned and arranged but sadly after one treatment it was apparent the treatment was too late and any further treatment cancelled. The grim reality was Ben's care was now palliative. There would be no miracle cure, no bounce back (even though everyone still hoped) and it was agreed as per Ben's wishes that he should return home for his final days of care. Still Ben showed his love, care and concern for others by not wanting anyone other than mum dad and Dan to know how serious his condition now was. He wanted them to remember him as the cheeky, fun loving scamp that they all knew and loved back. On Sunday “28th February 2016 Ben passed away at home with his mum dad and brother holding him and loving him as they always had and forever will. Ben never complained or felt sorry for himself, his only wish was to help others so he set up BK’S Heroes and his dream was that one day ,TOGETHER ,we can find a cure.